Thank you so much, Pamela, for having me here today! After a wonderful, but whirlwind Christmas, it's nice to be back! 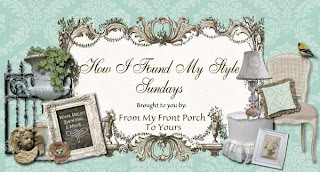 I am Andrea, from the blog Willow Wisp Cottage. I originally named my blog for the huge willow tree that grew in front of our home on Vancouver Island. We have since moved to Alberta, but I've been sure to plant a new willow, in hopes it will soon grow to be as glorious as our last. Our home, picture taken this past fall. It's now a winter wonderland here! This series is about how you found your style, but truth is, I'm still searching! I'm sure you can all relate to seeing a blog, or magazine, and falling in love with that style, only to see something completely different the next day, yet love it equally as much! I'd say my style falls mostly into the Cottage/Farmhouse category. Our home is a Westcoast/Craftsman style, so I've tried to meld my 'look' into our homes style. A great example of my style is seen in my kitchen. I say this because we completely remodelled our kitchen, so it's a space most reflective of us. Not too fussy, with simple shaker style cabinets, but nice thick crown molding to glam it up just a bit. Fun lighting, and some rustic elements such as the island top, and it's perfectly 'us': my version of cottage/farmhouse. Our main floor is a completely open floor plan. This is both great, such as for entertaining, and tricky when trying to decorate the space, and make it all flow. 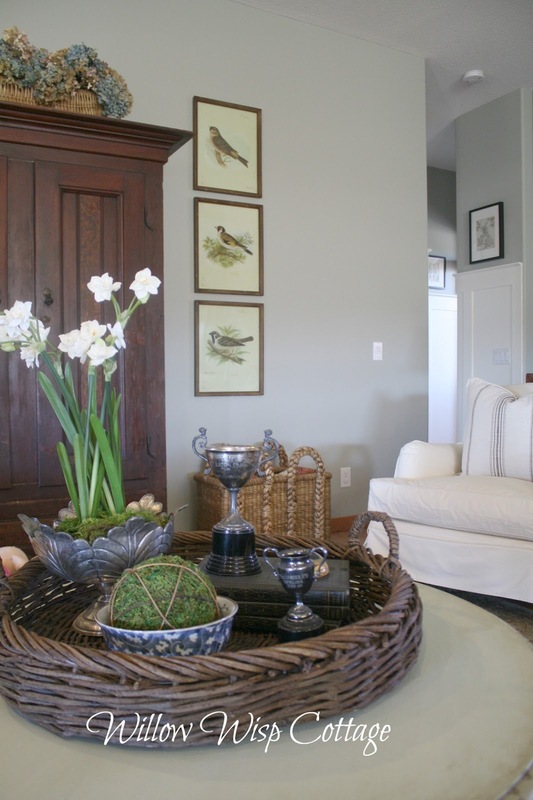 I love to incorporate antiques, family pieces, and new pieces. I don't care if it's something inexpensive I find, or a big ticket item that I need to save up for; if I find it beautiful, and it speaks to me, I try to find room for it in our home. I am rather addicted to textiles. I love draperies, such as these buffalo checks that I had made for our dining spaces. I also love throw pillows and beautiful linens. I am an avid quilter, and if you come over, you can grab one of our many quilts from a huge basket, and get cozy! 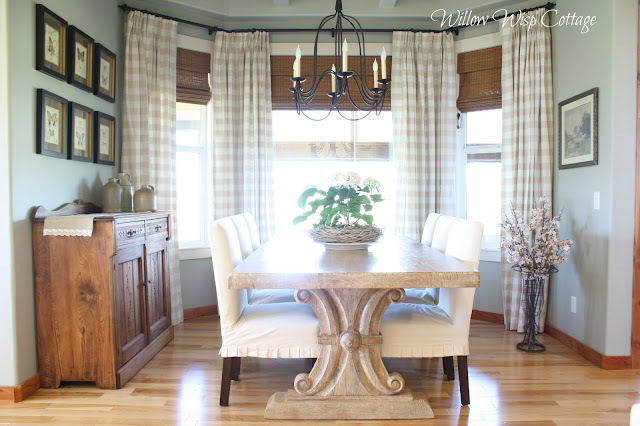 Another favorite space, which I think defines my style very well, is the sunroom. Cozy, with a mix of textures, such as the planked ceiling, and walls, and stone fireplace. There's a mix of special antiques, handed down to me from my Grandmother, or found on treasure hunts, and new finds such as the striped chair or loveseat (inexpensive items from Pier 1 and Ikea). Thank you so much, Pamela, and thank you to your followers, for taking the time to read about our home! Andrea thank you so much for stopping by today and sharing your style with us! I am truly honored to have you here. Your home is just amazing and I have loved watching you transform it since you moved in. You certainly inspire us all. love Andrea's style. a perfect mix of cottage and traditional! Andrea's home is just beautiful. Love her style. 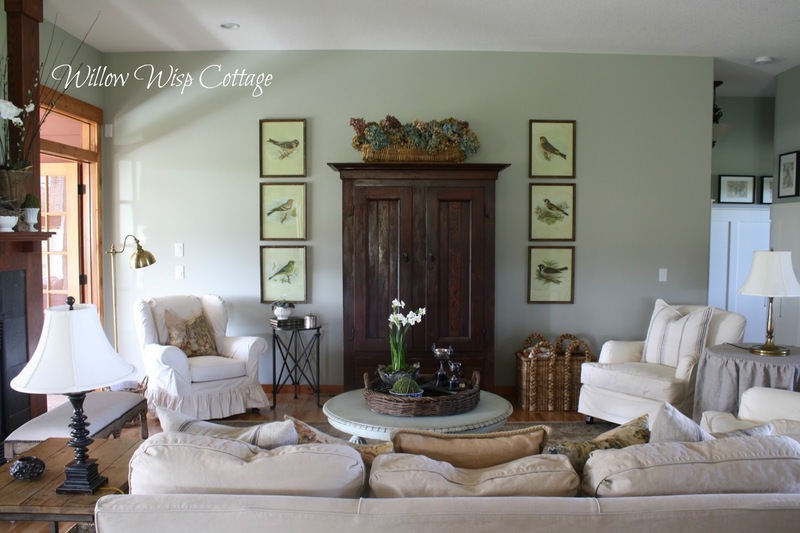 I loved watching the transformation of those rooms and the outcome is stunning! love the sun room and kitchen. your home is very comfortable looking, while still stylish. love it. Beautiful home and so many wonderful touches. Hands down the sun room has to be my favorite. Wow Andrea, your home is amazing. Can you come decorate mine? Thanks for sharing your lovely home with us. Thank you for featuring Andrea this week Pamela. her home is just stunning, from the stone on the exterior to that gorgeous kitchen. And I so agree with her, our style evolves, sometimes we have to have a mix of pieces in order to make it "home"! I've been following Andrea for quit some time...love her style and beautiful home!! I follow her and love her style and home! Great feature!!! Pamela, can you e-mail me? I have a question and can't find your e-mail address here. Thanks!!! Absolutely beautiful! The kitchen is a dream. Everything looks so comfortable and welcoming. I really enjoyed this weeks guest. I felt right at home "listening" to her "talk" about her home. Such a lovely home. I see so many wonderful ideas! Thank you for sharing this beauty! What a beautiful home, you had me at that gorgeous kitchen - sigh!!! Gorgeous. I just love her home. Andrea's home is so beautiful…always love seeing it…she is so very talented!..Love her sunroom and love the way she showcases her beautiful antiques throughout her home! Great feature!! Perfection and all the right details and touches. Thanks for sharing this lovely home!